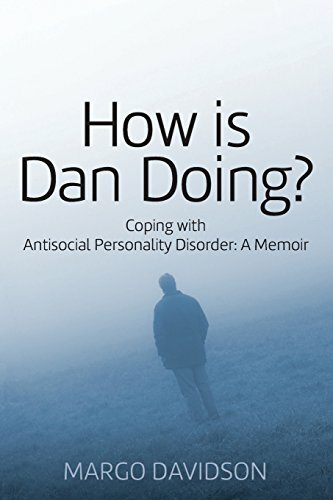 In “How is Dan Doing?” author Margo Davidson recounts her personal experiences of raising a child who has Antisocial Personality Disorder (APD). In sharing her life with us, we gain a better understanding of how the disorder not only affects the person with it, but also family and friends. Dan was an adopted child raised in a loving normal environment. In spite of this, he began displaying symptoms of the disorder when he was young. As he aged, it became more apparent that something wasn’t right. He followed many of the patterns of the disorder however, not the ones that society tends to use to stereotype someone with APD. He was not violent, nor did he seem to be heavily involved with drugs (characteristics society tends to put on violent criminals). Dealing with Dan was very difficult for his immediate family. There were moments when he would shine and they would let their guard down. Shortly after doing so, he would revert to his old patterns, which included stealing from them and writing bad checks on their accounts. Confrontation would follow these instances and then the family wouldn’t hear from him for a while. Like other people that I know who have a family member with this disorder, they keep giving them a chance to change, but the patterns continue and the families are let down. In addition working professionally with people who have APD, I also have a family member diagnosed with it. He is so much like Dan, versus the people with the disease that often make the news. At this time, he has cut all family members off, including his own young children. It is extremely painful to have a person like this in the family. I still care about his wellbeing, so I check in on him from a Facebook account that he doesn’t know I have (and hasn’t blocked me from). I appreciate Margo Davidson sharing her story because I think that there are more families out there, like mine, who will be able to relate to her experience.